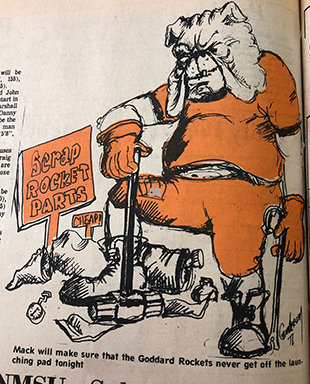 An Artesia Bulldog sets up an impromptu yard sale for scrap Rocket parts in this 1977 drawing by then-Artesia High School art teacher John Gunderson. The ‘Dogs will travel to Wool Bowl for a 7 p.m. game today against Goddard with the chance to improve to 2-0 in district play on the line. Not many districts in high-school football can boast containing the classification’s top three teams. But such is the situation in southern New Mexico, where, over the past few seasons, perennial contenders Artesia and Goddard have come to be joined by younger-sibling-hitting-a-growth-spurt Roswell High at the forefront of the Class 5A conversation. Putting aside all animosity, what that means for the district is impressive. What it means for the Bulldogs is that, for the second consecutive week, they’ll be tasked with hurdling the class’s top-ranked team in their quest for a District 4-AAAAA crown. Goddard took over the No. 1 spot following Artesia’s 36-35 victory over Roswell last week on the legs of their 7-0-1 record and a 47-0 drubbing of Alamogordo in their D4 opener. After defeating St. Pius 48-13 to start the year, the Rockets were in the midst of a defensive battle against Carlsbad when weather forced the game’s end at the half, resulting in a 0-0 tie. From there, Goddard went on to log wins over Deming (28-16), Portales (28-0), Los Lunas (28-27 in OT), Lovington (49-28), Santa Teresa (22-8) and Alamo. Leading the charge for Goddard has been 6’2”, 191-pound senor quarterback Dalton Bowles, a versatile athlete who prefers to leg out yards but can go airborne if necessary. “He’s a really good runner,” Artesia head coach Rex Henderson said Thursday, “and he’s a good enough passer. They’ve been able to move the ball on everybody they’ve played this year, with the exception of Carlsbad early. The Bulldog defense has had an overall stellar season thus far, holding their opponents to an average of 27 points a game. Pare that down to opponents not in Class 6A, and that average becomes 19. As was the case last week against Roswell High, the fundamentals will be key tonight if they want to contain the Rockets. “We’ve got to tackle like we’re taught,” Henderson said. “I think we’re playing really good defense in terms of getting lined up and being in place, but it’s going to be important that we wrap up and do things technically well. The Rocket offense returns only one starter from a 2017 team that fell to Artesia 56-12 at Bulldog Bowl. The ‘Dogs were able to build a 49-6 lead at the half in that contest while outgaining Goddard 395 to 223 in terms of total yards. Junior Robert Aragon was under center in that meeting but has moved further into the backfield as RB this season to make way for Bowles. Aragon was 9-30 rushing with one touchdown against the ‘Dogs in 2017. The Rocket defense, meanwhile, contains four returning starters, and – as it traditional with Goddard – the bulk of the lineup competes on both sides of the ball. That includes seven members of the starting offense: all six skill players and one offensive lineman. “They’re not as big as some Goddard teams in the past have been, but they’re still physical with their linemen on both sides,” said Henderson. “Defensively, it’s a lot of what they’ve always been – they’re going to have deep safeties to try to keep everything in front of them and make you earn what you get. After a few glitches early in the year, the Bulldog offense has been hitting its stride of late, finding that rhythm despite shifts in the QB position. Starting senior quarterback Trent Taylor, who went down with an injury in Week Two against Hobbs, returned to the lineup last week against Roswell, passing for 330 yards and three touchdowns. “We’ve got to continue to execute well on offense and continue to sustain drives – do the things we’ve been doing well in the latter part of the season,” Henderson said. While any district game comes with the X factor of emotions running high due to old rivalries, district championship goals, and the impending playoffs, the Artesia-Goddard series has developed into something a bit further up the contention scale. 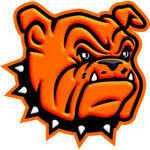 The Rockets – as do most teams when competing against the Bulldogs – will be throwing everything they’ve got at the ‘Dogs tonight, and Artesia will need to be ready to keep a cool head and a hot hand. “We know that Goddard will come play physical, tough football on both sides of the ball,” Henderson said. “So we’ve got to match their physicality, especially at the line of scrimmage. They’ll try to be intimidating and do the stuff they like to do, but we just have to do our jobs, match them physically, and get after it.